Things have changed quite swiftly in this world. We all people are going through a lot of things. We all people have developed a lot. Majority of these things have become only possible because of the internet. This is the age of the Internet and the actual thing is that there is no stopping it. People are sharing ways to make money online on their blogs, websites and Youtube Channels. And Google AdSense is one of the ways to make money online But today we are going to discuss top Google AdSense alternatives ways to make more money online. The Internet has created a kind of new world where people working on the internet are having their own new world. People are working on the internet and have their sources of income on the internet. One of the most important ways through which a lot of people are earning money is through Google AdSense. It is just like heaven for a lot of people. Google is a great company and Google AdSense is one of the ways through it is making things happen for the people in the financial terms. Now the main issue is that if someday gets an email that your Google AdSense account has been banned. You would not actually believe it at first. But now it is true. This thing happens to a lot of people. There are different reasons which might have lead to the banning of your Google AdSense account. Following are the main reasons. The main reason could that they could be problems with the web where you are putting your ads. The reason is the most likely one for such a thing to happen. The reason could that you might have missed some rule from Google. Tried clicking on your ads and asking people to do it. So these are the main reasons for such a thing to happen. In this article, we just want to assure you that the things are not over when the Google AdSense is over. You just need something else. Here we will help you in finding it. But the main thing is that you need to believe that you can do better without Google AdSense as well and Google AdSense Alternatives can also be a good opportunity for you. Now we are coming to the solution which is needed by you at the earliest. This is the most important part of this article. 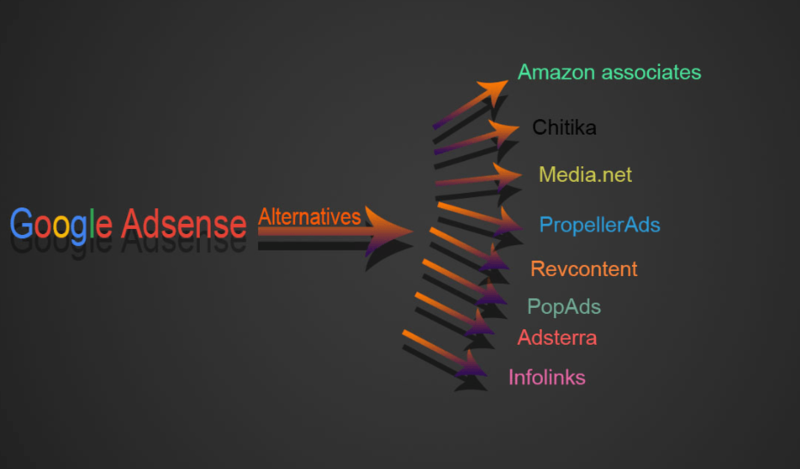 We want to clear that there are a lot of alternatives for the Google AdSense which one can use. You just need to know about them. Following are the most important alternatives to the Google AdSense which you can leverage to get your things back on track again. So this is a good thing to get things working again for you. This is the opening solution for the Google AdSense problem. So if you are having a website then you can try working with the Amazon for the promotion of their online products on your own website. Amazon will allow you to put image ads on your website to promote their products. So if someone buys the thing from that link you have put up on your website you will receive a commission for that. This is how things actually work for you with the Amazon associates thing. Amazon marketing reviews for you to check. So this is the first solution to your problems with Google AdSense with a good alternative. Another really great alternative to your problems. You can try Chitika which is really very similar to the AdSense thing with Google. They even allow customizing your ads. Chitika can pay you through PayPal and via check as well. Chitika is a really good alternative to the problems. It is something with which you can start working and getting paid a good amount as well. So this is the second best alternative to Google AdSense. Actually, this is the best alternative among all the one we have discussed already and the ones we are going to discuss in the upcoming article as well. Media.net powers Yahoo and Bing. Media.net develops Innovative digital advertising products for both publishers and advertisers. It provides a lot of different ways of advertising through which you can earn money. Media.net is trying to build a global contextual advertising business. That is why they are offering a lot to you. So get your things started with the media.net as soon as possible as it is the best possible solution. You can work with this thing as well. It is one of the largest pop-under networks available. They are very versatile and have specialization in monetizing websites in different niches. These are like entertainment, video and movies, games, software etc. So this is a great thing. So if you are having websites on one of the one discussed niches then things can turn really great for you. You can start earning more than AdSense. They have developed in a very short period of time which explains a lot of things. Moreover on the leverage side if you are having a good amount of traffic on your website then you can work under AdSense alternative as well which is a very flexible thing to have. So it is understandably a very good alternative to Google AdSense which can change your fortunes on the whole. One of the best things on the cards for you. Rev content has got some of the best quality ads and approval process in this field. Rev content actually tries to keep all the ads related to the content only which is the best thing about and the thing which makes really famous and popular. They pay very highly as well. With this, they pay you more revenue share like about 1 to 10 cents per each click. Some of the biggest and most famous websites all over the world like Forbes and PCWorld use rev content to add revenue to their AdSense earning. So you can start as soon as possible as well and start a good amount of money with Rev content. It is also one of the best alternatives to Google AdSense. How to make $100 USD per day? Another great alternative to Google AdSense. It is a performance network specialized in Popunders. They have got pop-ups, tab ups and under and other great monetization methods as well. So there is no need to worry about anything. They pay a good amount as well. Like they can pay you daily as long as you earn 5 dollars per day or more. This is a great thing about them which makes them great competitors in this fields market. They can monetize all the countries. So, a really good thing to start your things when you are abandoned by Google AdSense. It is a great network for publishers with Great CPMs. The ad format of Adsterra includes many categories like banners, pop-unders, direct links, web push notifications and many more. They pay to you without any hiccups and problems to you which is the really satisfying thing for you. So a great alternative to Google AdSense. They are one of the largest monetization Networks in the world for a lot of people. With great traffic on your website you can start using contextual and video ads, display banners of Infolinks for your own best. It is a great way to monetize your money as there are no restrictions over there network. So without a shadow of a doubt, you can start working with them for best results for yourself. A great alternative to Google AdSense. So these are some of the best alternatives to Google AdSense. So it is crystal clear that there is a lot of work with even in the absence of Google AdSense. Go through these alternatives and start working according to your own choice. You have got a lot of options. Choose from them wisely and start earning as soon as possible. It is going to help and your ambitions definitely. Google Adsense is the best and common way to monetize a blog but doesnt mean we just going to rely on it, there are many alternative you can choose from and this list is awesome! Thanks for sharing, we can try this one by one!